The Thermo Precision TSGP2S Water Bath provides consistent, digitally controlled heating with a shallow interior. This laboratory water bath is 2l in capacity, with a shallow pan, and a gabled acrylic lid, that channels condensation away from dripping back down onto samples. This sturdily constructed heating bath is epoxy powder coated for a chemically resistant exterior, and has a seamless, stainless steel interior, and heats to 100°C. This microprocessor controlled general purpose water bath features audible, user programable alarms, four temperature presets for repeated use, and has over temperature safety circuitry to prevent thermal runaway. 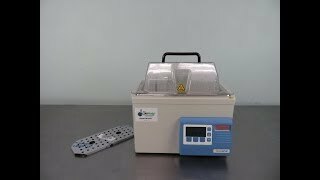 This Thermo Precision TSGP2S Water Bath is new, out of the box, and has been tested for funtionality. All of our lab equipment comes backed with our standard warranty. Should you have any questions, please don't hesitate to contact us.